I have loads of old mature oaks, dead oaks, and scrubby thickety woods here at PFHQ and together, they provide plenty of nesting opportunities for birds. I still get a kick out of tweaking the system though, and turning old dead boards into baby birds is a favorite kick. Even if you wing it, you will still probably create a house for something, but it's really fun to target a species...and then see them use your project. A while back, I bought some of those dog-eared fence pickets for a gate project and wound up with a few extras. Later, when I was feeling kind or eco-crafty, I noticed that those inexpensive fence pickets were just about the perfect dimensions for making nestboxes and I made a few solitary beehouses. When I switched from bee nestbox to birds, I decided to use an actual plan instead of freestyling it. So I went online of course, just for some ideas, ... and promptly discovered that a bird I took for granted, the Carolina Chickadee, was actually a species in decline. I thought these spiffy little sprites were uber commonplace. Not so according to Cornell and NestWatch. They are in trouble in the Southeast. Well, okay, ... I had my target. I built this custom Chickadee nestbox from plans I found at NestWatch. NestWatch is an extremely useful site for information on nesting habits of birds and plans for species specific nestboxes. From a single fence picket board I can easily get a nestbox with a little wood left over. We have an abundance of awesome grey ratsnakes around here and they can climb up a tree as if it were a ladder, so I did not want to mount the Chickadee box to a tree. I mounted my nestbox on a longer than usual backboard, because my plan was to mount the box to an old, unused volleyball net pole. Bolting it to a slick pole seemed like a pretty effective snake-proofing move. Above is the nestbox mounted on the volleyball net pole. I placed it right next to the blueberry patch, since the Chickadees are often flitting about in there. The box is a busy place with constant action. Action that I am happy to photograph. The same box plan is also suggested for the Prothonotary Warbler, but the location for the Prothonotary needs to be next to or over water according to NestWatch. I have the perfect place down by the pond, so maybe, just maybe, I can lure a pair of these beauties into my next affordable housing project. These 6 foot pickets are about $2.00 at Lowes or Home Depot ... shop at either, I have stock in both. I love love love this. Love this. The pickets look like good stuff! 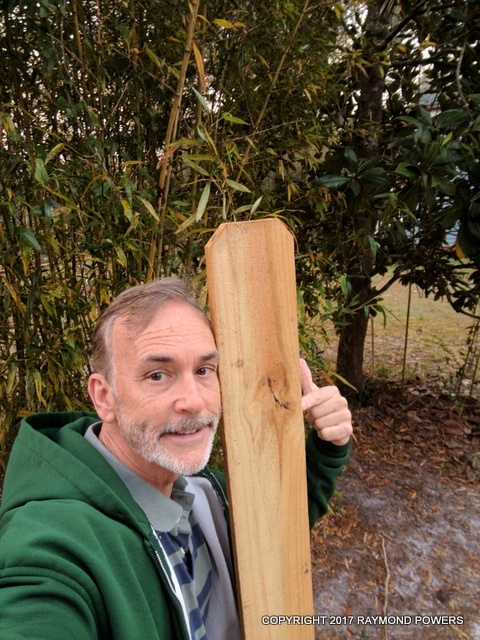 Cedar? Also. I know you know well the prowess of black rat snakes. I never underestimate black rat snakes. A simple cheap baffle that is not destroyed by wind is a nice big square of hardware cloth, thinner the better, affixed to the pole somewhere above snake stretch height. The idea is that it blocks the upward progress, and it's too wide for them to loop out and over without falling off. It's also flimsy enough to dump the snake should it get its chin up over it. Get the picture? Report back on them chickabiddies. Over and out. Great stuff! You have the best ideas and the skills to carry them out. This is going to be an inspiration to me. Jade has been trying to get me to put up houses for Eastern Bluebirds. Alas we are surrounded by farm with buildings (including our own) that are home to House Sparrows. It is hard to get BB houses far enough away from those buildings to keep the sparrows from doing bad stuff. However, I was thinking about putting a bird house on the sitting porch for Black-capped Chickadees or House Wrens. Both have nested in an ornamental bird house there. I'll bet they'd love the real thing. Now I will do it. So thanks. As for the bluebirds they nest in dead trees up in the center of our place far from the blasted Sassenachs. I agree with Julie. Would love to see more on the Carolinas. Saw some in Alabama this year but they don't come this far north. Love this. Inspiring, creative, and cool!